The PEB curriculum consists of 3 courses (Biological Physics, Methods and Logic in Interdisciplinary Research, and a course that is math/computation heavy - for most students, Dynamical Systems in Biology), in addition to the Integrated Workshop held prior to the start of the academic year. If needed, students can also take a primer course. PEB students complete the PEB courses in addition to their departmental graduation requirements. The PEB requirements have been carefully meshed with those of the home departments/tracks to avoid substantially increasing the course load for PEB students. Each PEB student must have completed all his/her PEB courses before the end of the second year of study. A semester-long course for credit. It exposes incoming PEB graduate students to range of qualitative methods and approaches used to study biological problems, develop communication skills across the disciplines, and ensure that incoming students feel part of the PEB community right from the beginning. 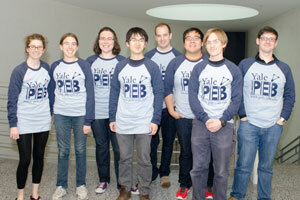 A group of faculty affiliated with the PEB program will co-teach. Examples of in-class IW modules are: “Zebrafish Elongation” “Proteins” “Crowding in the Cytoplasm” “Dynamics of Chromatin”. A half-semester intensive introduction to biological nomenclature, systems, processes and techniques for graduate students with backgrounds in non-biological fields including physics, engineering and computer science who wish to perform graduate research in the biological sciences. It will provide a basic coverage of biological nomenclature, systems, processes, and techniques to equip the student to subsequently take more advanced biological courses as desired. This primer class is designed for students who have little or no background in biology. Many PEB students will not need to take this course. The course offers an introduction to quantitative methods relevant to analysis and interpretation of biophysical and biochemical data. Topics covered include statistical testing, data presentation, and error analysis; introduction to dynamical systems; analysis of large datasets; and Fourier analysis in signal/image processing and macromolecular structural studies. The course also includes an introduction to basic programming skills and data analysis using MATLAB. Real data from research groups are used for practice. This primer class is designed for students who have little or no background in math or computation. Many PEB students will not need to take this course. A half semester class introducing integrated approaches to research. Each session will be led by two faculty with complementary expertise and will discuss papers that use different approaches to the same topic (for example, physical and biological or experiment and theory). Students first meet by themselves to hammer out the details of the papers, and then with faculty. An introduction to the physics of many important biological phenomena, including molecular motors, protein folding, bacterial locomotion and allostery. The material and approach are positioned at the interface of the physical and biological sciences. Advanced topics in computational biology and the techniques used to integrate knowledge from mathematics, physics, and engineering into the analysis of complex living systems as dynamical systems. Use of these methods to address key questions about the design principles of biological systems. An introduction to quantitative methods in biology, emphasizing numerical and analytical modeling of processes in biological systems. Instruction in the use of MATLAB; writing, understanding, and solving differential equations. Topics include switches, feedback, regulatory networks, cooperativity, and signal transduction. This course covers topics on mechanics and control of animal movement, including skeletal muscle mechanics, systems-level neural and sensory physiology, elements of feedback control and optimal control. At the end of the course, you are expected to become procient in deriving equations of motion for multibody mechanical systems that are actuated by muscles (or muscle-like motors), incorporate sensory feedback, and analyze properties such as stability and energetics of such a system. The course will use textbook material for well-established topics, and journal articles to explore active areas of research in neuromuscular biomechanics. Introduction to the analysis and interpretation of genomic datasets. The focus is on next-generation sequencing (NGS) applications including RNA-seq, ChIP-seq, and exome and whole genome sequencing. By the end of the course, each student will be able to process and analyze large-scale NGS datasets and interpret the results. This course is intended only for graduate students who are interested in applying genomic approaches in their thesis research. At a minimum, students must have basic familiarity with working in a UNIX/Linux computing environment. Prior experience with shell scripting or a scripting language such as Perl, Python, or Ruby is strongly recommended. Interested students must contact the instructor early in the fall term to discuss their prior experience and expectations for the course. Enrollment limited to twenty. This course designed for graduate and advanced undergraduate students is focused on systems biology approaches to the fundamental processes underlying the sensory capability of individual cells and cell-cell communication in health and disease. The course is designed to provide deep treatment of both the biological underpinnings and mathematical modeling of the complex events involved in signal transduction. As such, it can be attractive to students of biology, bioengineering, biophysics, computational biology, and applied math. The class is part of the planned larger track in systems biology, being one of its final, more specialized courses. In spite of this, each lecture has friendly introduction to the specific topic of interest, aiming to provide sufficient refreshment of the necessary knowledge. The topics have been selected to represent both cutting-edge directions in systems analysis of signaling processes and exciting settings to explore, making learning complex notions more enjoyable. Upon completion of the program, PEB graduate students receive a Certificate from the Integrated Graduate Program in Physical and Engineering Biology. They ultimately receive their PhD degree from their home department.